To download a list of projects by this firm in an Excel spreadsheet, see the Project Index. For instructions on interpreting the Project Index, see The Guide to the Project Index. See the Anshen & Allen Collection Finding Aid at the Online Archive of California. Bob Anshen (left) and Steve Allen (right) met in 1935 while earning both their Bachelor and Master degrees in Architecture at the University of Pennsylvania. They came to San Francisco in 1937 and while working for other firms secured their first joint commission: a house for Ralph K. Davies. They formed the architectural firm, Anshen & Allen in 1939. During WWII, Allen served as a Lt. Commander in the Navy and Anshen as a Technical Director for the Housing Authority in Vallejo, CA. By 1946, both were back to practicing architecture fulltime. The firm was known for a variety of project types including residential, commercial, educational, religious, and later specializing in medical buildings. 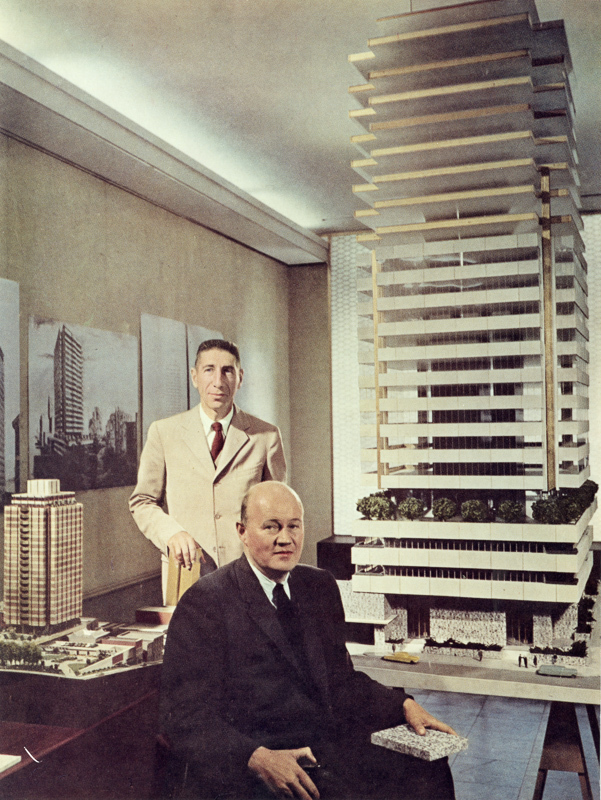 The Anshen & Allen Collection spans the years 1917-2007 (bulk 1940-1994) and includes projects files documenting the first 50 years of the firm’s history and the activities of the two founding architects. The Collection is organized into four series: Personal Papers, Professional Papers, Office Records, and Project Records. Well-documented projects include the Chapel of the Holy Cross in Sedona, AZ (1956), the Dinosaur National Monument Visitor Center (1956), the Ernest Moore House in Carmel, CA (1956), the International Building in San Francisco (1961), and the University of California, Santa Cruz Natural Sciences Master Plan (1964). The Church collection contains primarily office and project records. Archival materials include correspondence, subject files, a scrapbook documenting his published work, public relations files, portraits, photographs, a travel photograph album, and exhibit boards. The Oakland & Imada Collection includes files documenting the projects of the firm and its predecessor, Claude Oakland & Associates, and the activities of the two partners. The Collection is organized into five Series: Personal Papers, Professional Papers, Office Records, Non-Eichler Project Records and Eichler Project Records. The Scott collection documents projects and professional activities through personal, professional and faculty papers and office and project records. The Clarence A. Tantau collection consists primarily of residential drawings produced between 1921 and 1939.